If you follow pop-culture news much you probably are aware that Disney is planning some kind of streaming service they want to launch in the near future to compete with Netflix, Hulu, Amazon Prime, and all the smaller-name ones. In one effort to draw subscribers they might make short mini-series featuring characters from the Marvel Cinematic Universe doing in-continuity-to-the-film shows. Now, the, "Agents of S.H.I.E.L.D.," show and the Netflix shows with the, "Defenders," characters kinda-sorta take place in the same Universe as the movies, but we all know fully well that even if those shows draw from the flicks, the opposite ain't true. Actual ingrained-in-the-MCU continuity shows might really appeal to folk, especially if the rumors of ones starring Tom Hiddleston's Loki or Elizabeth Olson's Scarlet Witch come true. The thing is, I know one MCU character who barely gets respect and has the perfect story to base his show on. Yes, I'm talking about Hawkeye! Jeremy Renner is kind of like Hawkeye. He does a lot of thankless work, whether it is failing to start a spin-off of the, "Bourne," franchise, failing to match-up well with Tom Cruise's character in the, "Mission Impossible," series, or playing everyone's least-favorite Avenger, Hawkeye. Renner/Hawkeye had basically a weak cameo in, "Thor," was brainwashed for much of, "Avengers," and finally got an ounce of respect in, "Age of Ultron," but then mostly went back to being forgotten again. Not too long ago Matt Fraction had a stellar comic series about Hawkeye (that in many issues featured illustrations by the stellar David Aja). It had him living in a building complex threatened by gangsters, hanging out with a dog who loved pizza, and was quirky, action-packed, and highly enjoyable. A MCU-series starring Renner as Hakweye would be perfect for this. 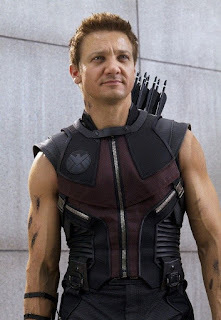 It wouldn't need too big of a budget, could have the trademark humor of the MCU, and would actually give Renner/Hawkeye something to do in the MCU. Depending on how much of a role (if any) Hawkeye will play in, "Avengers 4/whatever it ends up being titled," I would love to see this classic comic story adapted to a a short streamable series. Tweaks from the source material could be made, like having Hawkeye's family move-out from the countryside to NYC (as opposed to how he lacks the same thing in the comics) and his protege Kate Bishop could be introduced or not utilized as warranted by the script. Still, just drawing even a little bit from Matt Fraction's masterful run on, "Hawkeye," would be better than how the character has basically been treated ever since the inception of the Marvel Cinematic Universe.